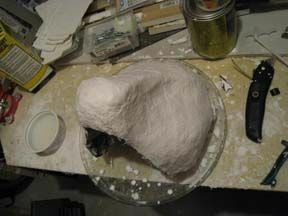 I sculpt a base for my heads using celluclay (an instant paper mache material). Once the base has completely dried, I rub it down with petroleum jelly as a release agent. I coat the head with plaster cloth to make a rigid, but light head base. After the plaster cloth has completely dried, I remove it from the base. I use a permanent marker to mark the position of the eyes and cut out my eye-holes. This head will have taxidermy eyes with tear-duct vision. The nose is sculpted to the head using a lightweight air-dry clay called "Delight." It's my favorite clay, it feels like sculpting with a marshmellow and doesn't leave fingerprints. Holes are poked in the nose to mark the position of the nose ring. The nose is sprayed with Plasti-dip, a dip or spray that coats whatever you spray with a nice rubber coating. This rubber material makes a great protective coating, however it is very caustic to use. Once dried, I attach the nose ring to the minotaur's nose. I add eye screens to the vision holes. This allows me to see out, while preventing people from seeing me through the eye holes. I use nylon painted black, but there are many materials one can use (buckram is a popular choice). Once the eye screens are in place I add the eyes. These eyes were cast from resin and the backs painted. 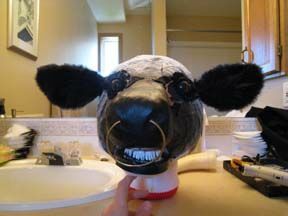 I add eyelids to the head with scraps of black cloth. You don't have to be too exact, as most of this will be covered with fur. But eyelids often allow more expression in the eyes and give you a nice finished look. Don't worry about the glue showing, you can fix and touch up that stuff with some black paint in the final stages. The Jaw is sculpted from upholstery foam. Teeth are sculpted from sculpty, and lips are a strip of vynil. These are hot glued to the lower jaw. The jaw is attached to the mask with a large piece of elastic. Positioned correctly, this makes a moving jaw. The elastic must sit under your jaw to stretch properly. 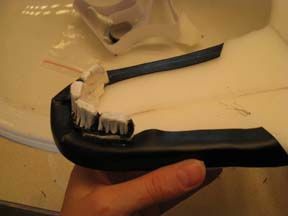 It's a finicky process, and often requires ripping off and re-gluing the elastic a few times to get correct. The head is now attached to the balaclava. 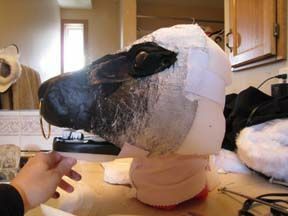 I glue the balaclava in place at the forehead, jaw and the back of the head. Once attached, I can fit the head on a dummy to work from. Padding is added as required to make the regid head fit smoothly over the skull of my dummy. Ears have been added to the head. They are made rigid with two sheets of sheet foam sewn into them. 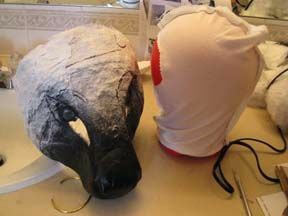 The back of the head is attached using hot glue around the edges of the minotaur face. I use a basic template for the backs of my heads. I made a copy of my template on a sheetof mylar and keep it in hand when I am doing heads, so I don't have to measure every time. I chose to use some pre-made horns instead of sculpting them myself for time constraint reasons. The horns were from one of those novelty Viking helmets. They were a little long so I had to cut them down. I filled them with expanding foam to increase rigidity, then sprayed them with plasti-dip (same as was used on the nose) for a nice protective coating. 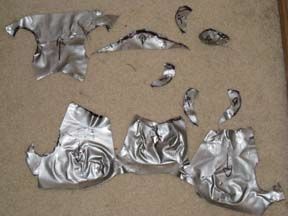 Here are all the individual cut-out pieces from the minotaur head. I stick them on the carpet so the duct tape looses some stick (nothing is more annoying than cutting out your pattern and having the duct tape stick to your arm when you move). Using hot-glue, I attach the fur to the head. It is a slow-going process,you have to trim edges as you work to make sure everything lines up smooth and properly. Here is my fully furred head. He looks a little shaggy doesn't he? Time to shave our minotaur: I use regular hair clippers to shave down the fur so it smooths out properly and evenly. You have to oil your clippers and treat them well, faux fur is pretty hard on them. Now to add the finishing touches. I use black paint for touch-ups to cover up any white showing, and blend the paint into the fur to add texture and shading. You can use an airbrush for this too, but since it is such a small area, I prefer a brush, I find I have more control with it. I have also added some brown color to the horns to give them some texture, and added Toro's earrings and decoration. Using some pink fleece, I sewed Toro a tongue, and glued it into his mouth. Annnd.... he's done! Yay!